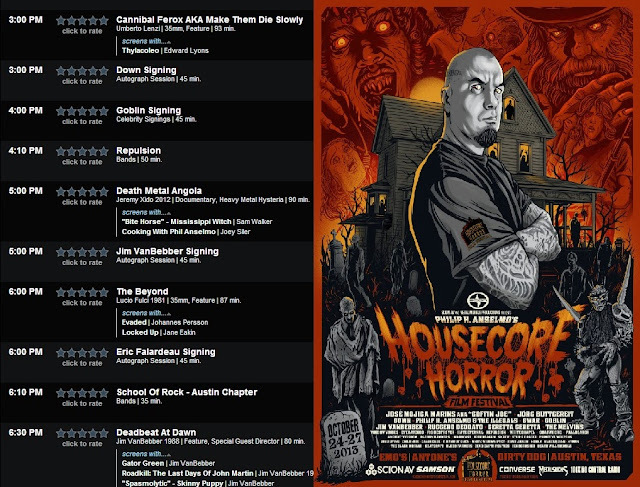 I'm sad to say that the Housecore Horror Fest has come and gone. It was a memorable weekend made up of celebrities, film, music, and even some disappointment. Prior to last weekend I'd never been to Austin, I wasn't really sure what to expect aside from heat and a lot of record shops. I wish someone would have warned me about the traffic though. I thought Dallas had bad traffic, DFW traffic is nothing compared to Austin. Even worse was the traffic just outside of Waco. We hit it on the way to Round Rock (the location of our Hotel) and It easily tacked an hour on to the drive. We eventually grew tired of the wait, once I'd ran out of fingernails to fervently bite off I decided to take my little KIA off roadin.' We sailed past most of the traffic, bidding adieu to our current frustrations only to meet a new one at the festival. Yeah, yeah, I know cancellations and conventions go hand in hand...But this was a big punch to the gut as it was completely out of left field. As I'm typing this there's still no official announcement about his cancellation on the festival's website. We found out on Friday afternoon, by Saturday night there were still people (apparently) lining up for his scheduled autograph signing. It was hard to get a solid answer from any of the staff as to the whereabouts of José Mojica Marins. After asking around we finally managed to get to the bottom of it, apparently the Brazilian icon had contracted malaria. Of course this is just hearsay but if it is indeed true I wish the actor/director a very speedy recovery! We were assured that if there is a festival next year they will do everything in their power to get Marins to the states. 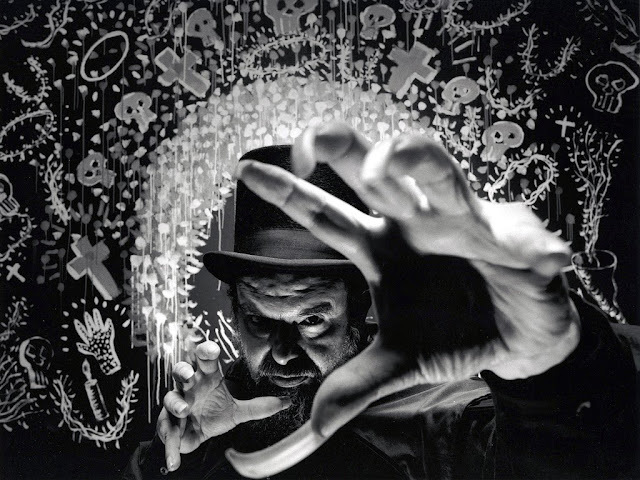 So to sum it up, I guess my biggest issue with the festival wasn't that Coffin Joe had canceled, it's that they didn't bother to officially announce his cancellation. Chalk it up to organization I guess. This is an issue that affects most first time conventions and festivals. Two other small issues: The layout would have been easier to navigate had there been signage and I'd have loved it if they'd have printed out schedules for the films. Enough wallowing in the negative BS, let's talk about the positives. The guests were signing for free. AHEM, let me repeat that last part...For free. I was shocked when I sat my Ultimo Mondo Cannibale hardbox in front of Ruggero Deodato and there wasn't someone sitting next to him collecting money. The guests were willing to sign anything you had (within reason) and were asking for nothing in return. This is a big deal in my book as a lot conventions would charge you to take a piss if they thought they could get away with it. The next great thing about HHF? There's always something to do! They're screening The Beyond at the Grindhouse tent. Don't like the film? Deadbeat At Dawn will be showing at Antone's right around the same time. Not in the mood for a film? There's either a band playing or an autograph signing. That was pretty much the entire weekend. It was almost overwhelming and I so regret only spending three days in the state. With the 16 or so hours of combined driving time I really feel like I missed out on a lot. Goblin! I'm almost embarrassed to admit that this was probably the first real concert I've been to in the last year. With that said, it was nothing short of amazing. My girlfriend, who's not even that familiar with the band, was completely blown away. Friday night's set lasted for about an hour, enough time to play a number of their most beloved tracks. It's hard to pin down the exact highlight of the set, for me I think it might have been when they played Lalba Dei Morti Viventi which was immediately followed by Zombi. It was pretty intense. Even with the lack of Coffin Joe the Housecore Horror Festival was a great experience that enabled me to meet a few great directors and to witness the mighty Goblin perform live. There were a few hiccups with the festival but those are issues that most of these types of events face with their first year. If we get a sequel next year I hope they rectify a few of those problems along with adding more film guests and pulling in a few more vendors. While Marins was unable to attend I still managed to snag his autograph and a few other items thanks to his assistant. The red poster was one of three colors, each limited to 25. They also had similar prints available for Down and Suspiria. The four DVD's were all signed by their respective directors. Missing is a Goblin record I purchased but sadly could not get signed. For those who also attended I'd love to hear your thoughts on the festival! If one of my flyers brought you to the website be sure to let me know! If there is indeed another Festival next year I will certainly be first in line. Five great horror flicks I've watched this week! The first Halloween contest ends @ Midnight! Win a Cannibal Reviews Halloween treat bag!